My riding officially started at 10 years old and I got my first horse at 14. In 1991 I went to college and then earned a Bachelor's degree in Equine Business Management and Riding at Johnson & Wales University including a trimester abroad at Waterstock House Training Centre in Oxfordshire, England. After school, I worked at a stable in New York for nearly 4 years and then came back home to Maine in 1998 and started my own riding stable. It wasn't until I took my first riding lesson with Judy in 1999 that I truly understood what a half-halt was and how to create one! That was the first of many breakthroughs I had in my own riding and training through lessons with Judy. With her help, I took my Dutch gelding, My Alibi, to PSG and my Swedish gelding, Raphael, all the way through Intermediate I. 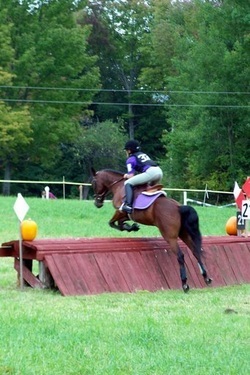 In every lesson with Judy, she has a specific exercise to overcome every hurdle and develop a rider's feel and timing. After each lesson with her, I come home and teach my students everything she has taught me. Judy uses a great combination of props, visual aids, demonstrations and her famous "lines drawn in the arena sand" to help ease comprehension. Her experience with different horses and different situations is vast and she has a story and example for each issue my horses and I present to her. Sometimes in lessons, I don't necessarily gain any new technique but get confirmation that my own instinct and problem solving is on the right track, which is just as valuable. It is tremendously important in training horses and riding to have eyes on the ground, no matter what level of experience one has, and I am very grateful that Judy can be my eyes! For the past eleven years I have been teaching and training in Southern California working with Adult Amateurs and Junior riders. I earned a USDF Bronze and Silver Medal on a horse I trained up the levels and have won many other regional awards throughout the years. Currently I am training two young imported German Riding Ponies hoping to inspire other pony owners to participate competitively in dressage. My expertise is helping riders that are interested in both competitive and recreational dressage maintain a safe, harmonious partnership with their horses. met Judy Westlake in 2007 here in CA when she taught a clinic at the Shea Center. I was so impressed by her teaching style that the next time she came to town I brought two of my students to clinic with her. There was so much improvement from one lesson to the next that I have encouraged all my students to ride with Judy whenever she is in town. My students and I have found Judy to have valuable insight helping identify and fix rider and horse issues that no other clinician has been able to help. The characteristic I appreciate most about working with Judy Westlake is she is excited to work with riders of all levels on all breeds of horses. Judy has the skill set to fix a simple posting trot problem or a complex passage problem. Her enthusiasm in her teaching is contagious and her lessons are always productive. She teaches a skill that can be taken home and used when working on your own. If only Judy lived here in CA we would all be able to reach our full potential without struggling so much. Thank you Judy for helping me and my students become better more effective riders for our wonderful horses. When I bought my Lipizzan mare and they told me she was "very dominant" I had no idea what that really meant. As they say, "When you buy a Lipizzan, you will either quit riding or become very good rider!" So true. Judy has helped me over to decades with both my thoroughbred and my Lipizzan mares. Her insight, her constantly seeking new ways to teach have given me continual progress with my horses. Riding well is a journey - I am deeply indebted to Judy for the joys I continue to discover with my horses! I started riding with Judy in 1995, I was a 12 year old girl with a flighty Arabian. I quickly realized and have appreciated over the years that Judy never judged the breed of your horse. If you have goals and are willing to learn Judy will instruct you like you are aiming for the Olympics. Throughout my teens Judy gave me the opportunity to lease two of her upper level school masters, Moe and Sylvester. Riding horses of that level was not easily found where I lived at that time and I learned an enormous amount from those two horses. From my later teens through my early twenties I spent five winters in Florida as Judy's working student. In those years I had daily one-on-one lessons where I learned a correct and effective riding position. Judy prepared me to be able to go out on my own as a professional, and she taught me tools that I will have for a lifetime. Judy influenced the way I teach in my lessons as well. As an instructor I aim to make a good experience for the horse and rider when working toward their goals and we always end on a positive note. Over the years I have had the opportunity to ride and train many horses, from starting young horses to working with upper level dressage horses. I am working on my USDF bronze medal with qualifying scores through Second Level. I am extremely grateful for the knowledge Judy has passed on to me over the years. This knowledge has helped me build a successful business of my own. Judy has given me opportunities and opened doors for me that I may not have had if I was not her student. - MDS Bronze and Silver Medalist. Thirteen years ago I attended an Adult Clinic, where Judy Westlake was one of the clinicians. I have worked with many instructors /clinicians prior and had a remedial expectation of how the lessons would go. The lessons were beyond my expectations and have been a dedicated student of Judy’s ever since. I rode with her during her time at Broad Park Equestrian Center in Gray, Maine and continue to ride with her both in Vermont and in Florida. 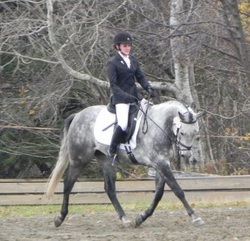 I own and operate a farm in Dover-Foxcroft, Maine specializing in eventing and dressage. I realize the importance of having a great mentor and having a qualified person to give another perspective to my students. 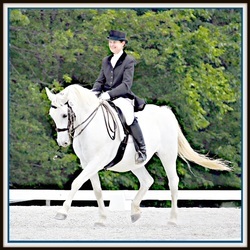 Judy is a USDF certified instructor, instructing from the German Riding System. 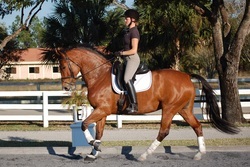 Judy adheres to the German Training Scale with excellent exercises, that apply from amateur riders first entering into the dressage discipline as well as professional riders that need a good exercise to get them through any “issue”. 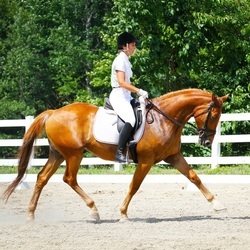 Judy has the ability to incorporate the importance of the foundation applications to help riders at all levels achieve better success with in their realm of riding. I would describe her as a “professionals professional” that has the ability to teach instructors and trainers in the profession, as well as any person that has the passion of dressage that she holds. I take students to Florida to have a “Wellington Experience” where there is an abundance of wonderful dressage activities and to watch the BEST riding in the United States. Students are offered and would always take DAILY riding instruction from Judy Westlake at her Loxahatchee Farm. EVERY student that I have brought down to Florida, rave about their time in Wellington and more so, their one on one time with Judy. One of my favorite things about Judy are our talks regarding the theory and application of Dressage. Teaching horseback riding especially dressage is a passion I have and I love our discussions of clarifying terminology and the application of aids. Judy is up to date in the “ horse world”, competition wise, breed wise, in the know of medical breakthroughs as well different tack options. I joke that she is a walking text book , it is impressive! I continue to ride with Judy and I am confident that as I evolve and learn, I have a wonderful instructor that will have the knowledge and ability to take me to the next level and give my clients guidance with tact and correctness. I started riding with Judy 5 years ago when my instructor Gail McCormack of Infinity Farm, Dover Foxcroft Maine, suggested I take some lessons with Judy while she was in the area on my current pony Scrappy to help us with some lateral and collection issues we were having. I have been riding with her in clinics and monthly lessons when she is in the area. Through her teaching in hand and long lining of both my horse and I she was able to help Scrappy and I develop collection and timing of aids that enabled us to compete through second level successfully. From my lessons with Judy I have learned a more in depth understanding of the application of the training scale and I have incorporated her methods of lunging and in-hand work through my training of my own and client’s horses. I have also taken lessons with Judy at her farm in Wellington Florida on her classically trained school horses. I have also worked with Judy’s horses under her tutelage. Judy has continued to help with me in lessons with three of my other personal horses and client’s horses. Through Judy’s instruction and training she has inspired me to teach, train and ride correctly through the levels so that I may one day excel to the professional level. I was introduced to Judy Westlake in 2006 as an adult beginner. With the exception of maybe one visit, I have ridden with Judy every time she has come to Maine, most times where I was boarding, but also at occasional clinics elsewhere in Maine. In addition, for the past four (4) years, I have scheduled vacation time so I could ride with her for a week or so in Florida. Since 2006, I have ridden lesson horses, my own formal barrel racer, and a Third-level dressage horse that I leased for a few years. In 2010, Judy traveled with me, first to Florida, then to California, to go horse shopping. Judy found Sammy, the perfect horse, to take me up the levels. While Judy is invested in each rider, and approaches their position as if one day they will ride at the level of Grand Prix, she places equal emphasis on the care, well-being, and development of the horse. I was fortunate to have Judy work with Sammy and me for ten weeks during the summer of 2012. She will push the rider past their comfort zone into an area that challenges them both physically and mentally. Being an Adult Amateur, I present Judy with certain challenges. She never fails to come up with creative ideas to make sure I understand an exercise while keeping Sammy on track. I cannot say enough about the respect and admiration I have for Judy as a rider, trainer, and clinician. She has developed me as a rider and just recently coached me through my first successful USDF show. I recommend her without reservation. Judy Westlake’s focus on her teaching and training is a passionate and precise understanding of what it takes to develop horses and riders from a theory standpoint. 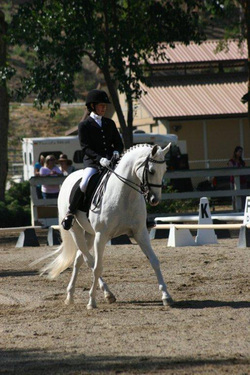 While she fully understands and can teach and ride the German dressage methodology, she is able to integrate and has been influenced by the French and Spanish dressage schools as well as a host of other educators and mentors in the horse world. Her approach to her work with horses and riders is holistic and draws from a vast array of experiences. I have been a long time student of Judy’s and credit her with my current knowledge and exponential growth over the years. She is able to explain the mechanics and physics of riding and then progress you into the “feel” side of riding. I have progressed from a typical rider that rode as a child in the hunter arena. I started with Judy doing some small cross country shows and then got into the art of dressage as her knowledge, skill and harmony with the horses drew me in. I have grown from a training level rider to getting my Bronze Medal in dressage and currently working on my Silver Medal. This was all accomplished by clinics over the years as she can come in for a few days and give me a months worth of knowledge and exercises to apply on my own. Judy gives you tools and then teaches you how to use them. She draws from a wealth of information and then forms a plan that you know how to follow. I progress my riding in between clinics with Judy because her methods are so good and her plans, and the ability to teach us as students how to use them, are so solid. So many times I’ve ridden with people and had a great ride, but not known how to produce it afterwards in my own practice time. Judy’s work leaves me empowered and able to work on my own and with confidence and success.